JENN: I am so excited to have my friend Kate Carlisle here with us today! 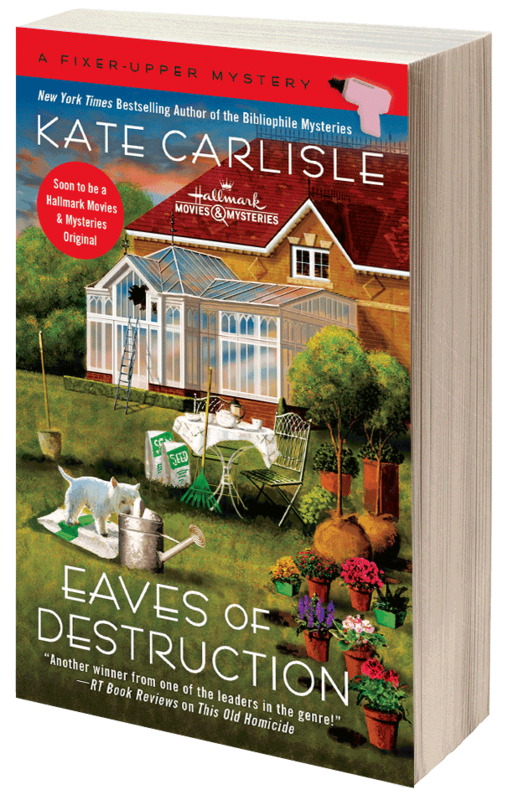 Kate always makes me laugh - in person and in print - so needless to say I already have her newest book in my hot little hands and if you don't, you should! 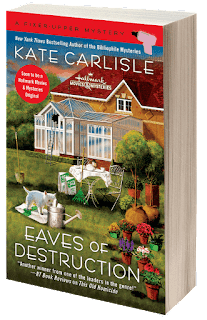 Kate Carlisle is the New York Times bestselling author of the Fixer-Upper Mysteries, featuring Shannon Hammer, a home contractor who discovers not only skeletons in her neighbors' closets, but murder victims, too. 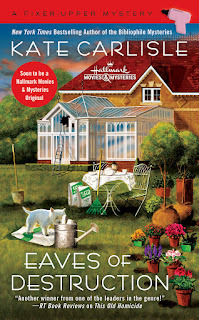 Eaves of Destruction, Fixer-Upper Mystery 5, is available now. Hallmark Movies & Mysteries is bringing the Fixer-Upper Mysteries to TV in a series of movies starring Jewel and Colin Ferguson. Visit Kate online at www.KateCarlisle.com. We all dream of that happy little neighborhood, where we get together for block parties, water each other's plants when one of us is out of town, exchange cards at Christmas. Barring that, we hope that we can politely ignore each other and go on with our lives. Sometimes neither of those things works out. Sometimes neighbors become friendly rivals, and sometimes those friendly rivalries turn darker. Have you ever lived in a neighborhood where everything becomes a competition? Whose yard is the nicest? Who has the biggest, brightest, gaudiest display of Christmas lights? I recently read an article about a man who started buying Christmas lights with his high school paychecks, and has continued to add to his collection every year. Imagine if he lived across the street! You could go broke trying to compete with him. In Eaves of Destruction, it's time for the Annual Victorian Home and Garden Show. 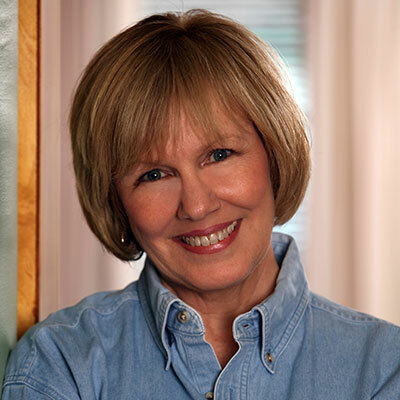 For years, Petsy Jorgensen has seethed at her failure to win Best in Show. This year, she's determined to take the honor away from her neighbor, Joan Derry, no matter what. Contractor Shannon Hammer has been hired to do finish work for both homeowners, and she's determined to remain unbiased and do her best work for both, despite strong pressure to show favoritism. The rivalry escalates, as these things often do. . . but in this case, someone winds up dead. And Shannon feels honor-bound to catch the killer since the murder happened on her watch. The small town's corrupt building inspector is found dead on one of Shannon's jobsites, and soon plenty of suspects are coming out of the woodwork. When another body is discovered, Shannon calls on her team of close friends and devilishly astute thriller writer Mac to help her nail down the details and build a case against the killer before the door shuts on someone else—for good. And now to you, readers. What kind of relationship do you have with your neighbors? Has your relationship with them changed since you first moved in? Congratulations, Kate, on your new book . . . I’m really looking forward to reading Shannon’s latest adventures. Houses [and, therefore, neighbors] here are not particularly close . . . all of us have deer, wandering turkeys, and lots of trees in the immediate vicinity for our neighbors. Beyond that, for us, there’s family within shouting distance on one side of us and friends on up the road a way . . . . Your neighborhood sounds bucolic. Probably no feuds between you and the deer. The new book sounds fun, Kate. Congratulations! I'll confess that I've been aware of your series, but have never dipped into it. I'll have to remedy that, as home repair is becoming a way of life for me. There are really only four houses in my immediate area, and one of them sat empty for a couple of years, but I've taken my neighbor to the north out to lunch, and she pops over or calls whenever I'm doing something new to the house. She's in her eighties, and knew all the original homeowners on this street, so she can dish on all the history. The guy across the street lives behind a lot of bushes, and I don't see much of his comings and goings, but he brought me four perfect, just-off-the-vine tomatoes once last summer, and we wave to each other. It's the guy who bought the house to my south I have a problem with. We share a fence, but our dogs are not happy with each other, so they bark. I just bring my dogs in when the barking starts, but he has decided he must find a way to make my dogs stop barking entirely. I had to consult the police about one of his tactics. He has backed off, for now, but guys like that never really give up on the idea of imposing their will on women and animals, so I'm monitoring the situation. Wow, that sounds scary, Gigi. I hope he sees reason and doesn't cause you too much trouble in the future. At least you have a couple of nice neighbors. Congrats on the new book! Thanks to FB messaging, my neighbor can let me know there's a package on my front stoop, or I'll let her know she's welcome to come over and gather armfuls of fresh dill. Another neighbor will text me about her cat, or I'll let her know we'll be away for four days. It's very supportive. Since my office is upstairs looking out at the street, I consider myself one of the street monitors, LOL. That sounds lovely! We moved recently, and our new neighborhood is much more supportive of each other than the previous one. All nice neighbors in our old neighborhood, just busier in general and less available to make connections. The new book sounds like so much fun - thanks for sharing. Our neighbor next door lights up her house at Christmas, big time. Inside she's got tree, a nativity, and holiday figures and light ALL OVER! Going from room to room is like wandering past Macy's windows. Or was it Lord & Taylor that had the great ones? We're a little black hole on the street, but I enjoy everyone elses'. Good grief. That would drive me nuts, especially the lit stuff. A friend once said we should all ask our neighbor across the street what color to paint our house. We might also ask them what level of nighttime lighting to use. I am contemplating blackout drapes for my bedroom. Oh, Karen, I don't want my neighbors weighing in on house color! Of course, we live in an HOA, so we're limited anyway. Hallie, that level of lights can be distracting. I'm glad you enjoy your neighbors' lights. I just can't wrap my head around the amount of work one must do to set it up and then (worse) to take it down. But I'm glad other people like it because I do enjoy driving around to look at lights. Agreed. Kate! How difficult would it be? And I wonder--is it fun? Most of our neighbors, whose homes we mostly can't see from our house, have been friends with us for decades. Except. The two closest to us, whose properties back up to the side of ours. Oddballs in both homes: a pair of bachelor brothers in one, and a long unmarried couple in the other. One of the brothers has a job, and he does all the cooking (we could see into their kitchen from ours until recently, when they put a blind on the window over the sink. This is after living there for about 15 years. Why now?) The other brother appears to be a heavy drinker, and he doesn't drive. We see him trudging up the street twice a day to the convenient store, returning with a six-pack. The other house was bought by the woman who lives there about 25 years ago, and her boyfriend moved in when she did. He's a blowhard and a bully, and lazy as sin. He'll have someone cut the grass, and while they're cutting it, he's barking orders about the job (in a yard the size of two average garages) the whole time, over the noise of the mower. A couple of years ago, she started doing the yardwork, and he criticized her every minute she was out there. It's so upsetting. Luckily, we have bushes and trees along our fenceline, but it doesn't stop us from hearing the loudmouth. But on the other side lives the cutest young family, with an adorable four-year old son and their new baby girl. So things even out. Wow! Well, at least he gets some exercise. Snork! Ooh, what a good idea, Kate! Congratulations, Kate! We live in an apartment, so only have one neighbor who puts a lot of ugly, obstructive holiday objects in the hallway and then pretends they're not hers when the holiday is over (currently it's two rotting pumpkins...). To compete, we drink more eggnog. Already started the book, love it. You're kidding! After the holidays, she just... leaves them? That is so antisocial! I'm glad you're enjoying EAVES OF DESTRUCTION, Wendall. Thank you for letting me know! Kate, welcome to Jungle Reds! A friend used to live in a neighborhood where one house across the street was owned by the KKK or was it the Nazis? It was really scary! My neighbors are lovely. I have a funny / sad story. When I was a kid, a new family moved across the street. They came from another country. Because I had a profound hearing loss and communicated with kids in the neighborhood in Sign Language, the parents in that family thought that I was retarded. Ha ha. I did not know until recently. Your new book sounds interesting. Speaking of competition, I am reminded of one of these Christmas movies where neighbors are always competing. Was that the movie with Kevin James and Tom Arnold? OMG, that would be so scary to live next door to racists with a violent streak! Unfortunately, I think a lot of people mistake a hearing disability for a mental disability. I hope they were kind to you. Congratulations on the book, Kate. I have been fortunate in that I've always gotten along well with my neighbors. You are a lucky girl! I am, too. Though I've had neighbors that I wouldn't call friends, I've never had an adversarial relationship with one. Neighbors! I do have the best! I live in a very rural area where the houses are not close. But luckily my neighbor's dog heard me yelling for help when I fell with my broken leg. She and her son were my angels. This area has many "summer" homes and one of the "downstaters" requested that his neighbor here not mow the grass until he came up so that the grass levels would be equal! Oh, goodness, Judi! That is so fortunate, not only that the dog heard you but that he was able to communicate a sense of urgency to get to you. My jaw dropped at your story. I would've been tempted to say, "The world doesn't stop when you're not around." Congrats on the new book and the awesome title! My wife thinks I should try to get a job coming up with these funny titles, because I enjoy them and sometimes make up alternate punny titles fr things I've read. We've never lived in a neighborhood where there was a lot of decorating competition, but especially when we lived in Wilmington (NC), we have generally seen where those neighborhoods are and walked or driven through them as the holidays approached. Free entertainment. Titles are SUCH a challenge! We're trying to come up with one now for the next Fixer-Upper Mystery, which will be out in about a year. We had one that everyone agreed upon (me, my editor, my agent, and marketing), but then someone realized that our wordplay had a second meaning that wasn't at all appealing. So it's back to the drawing board! Our challenge is to come up with something that incorporates a tool/home repair connotation and something that has a mystery feeling to it. EAVES OF DESTRUCTION fit those requirements perfectly. I'm glad you like it! I enjoy this series, Kate! We have been very fortunate as to neighbors. With our moves we've had quite a few over the years. We joke about keeping up with our one nextdoor neighbor. She has had improvements done on her house, some of them using people we had working on our house first. So we kid back and forth and recommend different people for repair jobs. She and my sister helped me narrow down which color to paint the house. We have had weird ones in years past, but that was long ago and far away! Weird neighbors, not weird colors. LOL! I was imagining all sorts of weird colors! The 70s were a wild time, after all. 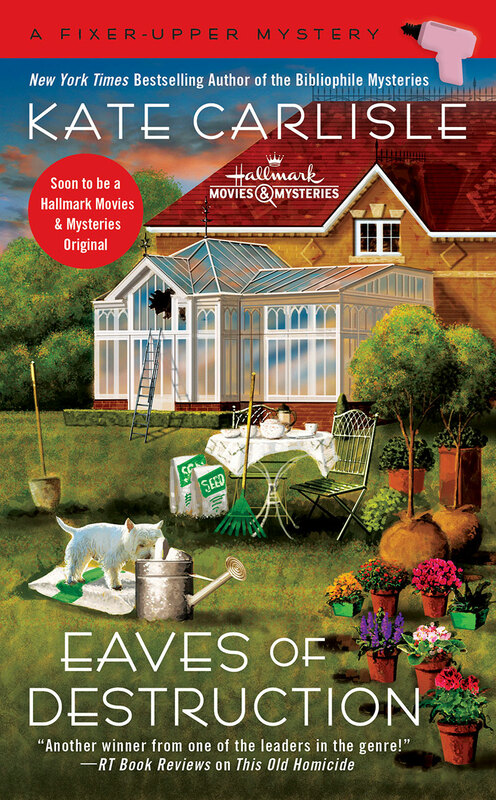 Congrats on the new book, Kate, and the new Hallmark series! We live in a high rise and rarely see our next door neighbors, but are good friends with people on other floors. When we had a house, there was one family, in particular, who mystified us. There were comings and goings at unusual hours, and they would show up with different cars. We used to speculate about what was going on; I'm sure our ideas were more colorful than the reality! Ingrid, our neighbors out in the country have a different car, truck, tractor, and horse every month or so. It defies sense. My husband says it's a holdover from the old horse trader mentality. He might be onto something. It must be really nice to have friends in the same building so you can watch out for each other. Really makes a high rise feel more like a cozy neighborhood. Our neighbors on one side our dear friends, but they have no decorations, except for their all-white-light tree which I can see through one window. So that’s lovely. Down the street and over one block? WHos. It is light city, it is ridiculous! With every square inch of everything covered with lights. I would go completely nuts, totally and completely nuts. Let me say, too, they do the same thing for Halloween. Spiderweb stuff, and truly creepy skeletons and zombies hanging from trees and things. Monsters, dark green and brown, peeking up from under porches. If I were a little kid, I think I would be terrified. An adult, I am terrified. Not Whos. Although that would be pretty funny. It was supposed to say whoa . I thought you meant WHOs, too, Hank. So funny. I know! It's much funnier that way. I wish! LOL! That doesn't sound far off from Whoville, actually. Alas, our relations with neighbors are basically cordial. There are some little bones of contention, but nothing insurmountable. Nobody here goes overboard with holiday decorations and it seems many are giving it up altogether. Personally, I always like to do something on the outside because it makes me feel like I'm doing my part to help with the holiday spirit. That's lovely and civic-minded of you, Terry. Great reason for decorating. I live on a condo, and my neighbors are complete jerks who don't think about anyone but themselves. They litter like crazy and constantly smoke in their garage, which is right under my bedroom. Even when I ask them to stop and they promise it will, they start up again a couple of weeks later. And I am constantly having to dodge their cars to get into and out of my garage when they park directly under signs that say "No Parking Fire Lane." If they were to ever move out, I'd celebrates like crazy. They sound horrible, Mark. I hope that they do leave soon, and that your next neighbors will be more considerate. Because we're in the historic district, the Christmas decorating tends to be considerably more eccentric than the all-matching neighborhoods on the planned side of town. We put up our own Christmas lights and I love them so much I always hate for them to come down on the New Year's Day. Thank you, Deborah. Jewel is wonderful in the role of Shannon. She's completely believable as a home contractor and amateur sleuth. She's got amazing feminine strength that really comes through in the role. I love dogs, but that would bother me, if my dogs weren't able to enjoy the yard because of the neighbor's dog's aggressive behavior. Clearly, the most interesting "bad neighbor" story in the news is the one about Sen. Rand Paul and his neighbor who was so disgruntled about "landscaping issues" he broke 5 of the senator's ribs! Yes! That was terrible. It does show that the things that happen in our books can certainly happen in real life. I prefer fiction! LOL!!!!!! You do realize, Jenn, that would only happen to you? Currently, our neighbors are good, but we pretty much mind our own business and speak when we see one another outside. Some years ago we had a neighbor from Hell, and I try not to think about it much. We live on a road that isn't conducive to neighborhood get-togethers. Growing up though, we knew and interacted with our neighbors on a daily basis, looking out for one another and sharing meals and the such. I do often miss that sort of relationship. Kate, I do need to start reading your Fixer-up series, as it sounds so enjoyable. I tried to get the channel for the Hallmark Mystery Movies when your show came out, and finally the person on the phone helping me told me I just didn't get that in my area. I haven't given up though. Congrats on the new book, Kate! And what a terrific name! I've never been competitive with a neighbor, but we have had issues with one. He was a drunk, and would get into frequent screaming matches with his teenage daughter. One day the guy came to our front door in tears (and yes, very intoxicated), saying she'd hit him over the head with a plate. "I'm bleeding, I'm bleeding!" he kept shouting. I took a look at the red substance all over his scalp and thought I knew what it was. I dipped a finger in, tasted it, and yes--ketchup! Thank goodness they've both moved away. I just lost my appetite! (Not really. Sadly, it takes more than that.) You must've been really confident to taste it. That poor girl. Imagine growing up with that chaos in your life. So sad. I'm glad they moved away from you so you don't have to be around it. I hoep they got help.